11 is a double digit and is therefore considered a Master or Power Number. In Numerology 11 represents impractical idealism, visionary, refinement of ideals, intuition, revelation, artistic and inventive genius, avant-garde, androgynous, film, fame, refinement fulfilled when working with a practical partner. 11 is a higher octave of the number 2 . It carries psychic vibrations and has an equal balance of masculine and feminine properties. Because 11 contains many gifts such as psychic awareness and a keen sense of sensitivity, it also has negative effects such as treachery and betrayal from secret enemies. Many associate 11:11 with a wake-up code/alarm as they see it on digital clocks and watches. It can also be seen as a key to unlock the subconscious mind, our genetic encoded memories, that we are spirits having a physical experience, not physical beings embarking on a spiritual experience. 11:11 or derivatives of these numbers, 111 and 11, are digits that repeat in time, thus a metaphor for reality as patterns that repeat in time for us to experience. This can refer to the rise and fall of civilizations, our personal experiences and lessons and loops in time. They are cycles of time that create and recreate, following the blueprint. Carl Jung, the father of analytical psychology, was fascinated by numerology. Not only did he study various numbers and their meanings, but he also looked at how (and why) our culture was (and still is) fascinated with numbers. The second way in which angels show you meaningful number sequences is by physically arranging for, say, a car to drive in front of you that has a specific licence plate number they want you to see. Those who are aware of this phenomenon become adept at reading the meaning of various licence plates. In this way, the angels will actually give you detailed messages. Here are the basic meanings of various number sequences. However, your own angels will tell you if your situation holds a different meaning for you. Ask your angels, “What are you trying to tell me?” and they’ll happily give you additional information to help decode their numeric meanings. 333 — The Ascended Masters are near you, desiring you to know that you have their help, love and companionship. Call upon the Ascended Masters often, especially when you see the number 3 patterns around you. Some of the more famous Ascended Masters include: Jesus, Moses, Mary, Quan Yin, and Yogananda. 555 — Buckle your seatbelt. A major life change is upon you. This change should not be viewed as being "positive" or "negative," since all change is but a natural part of life’s flow. Perhaps this change is an answer to your prayers, so continue seeing and feeling yourself being at peace. 666 — Your thoughts are out of balance right now, focused too much on the material world. This number sequence asks you to balance your thoughts between heaven and earth. Like the famous "Sermon on the Mount" the angels ask you to focus on spirit and service, and know your material and emotional needs will automatically be met as a result. 888 — A phase of your life is about to end, and this is a sign to give you forewarning to prepare. This number sequence may mean you are winding up an emotional career or relationship phase. It also means there is light at the end of the tunnel. In addition, it means, “The crops are ripe. Don’t wait to pick and enjoy them.” In other words, don’t procrastinate making your move or enjoying the fruits of your labour. 999 — Completion. This is the end of a big phase in your personal or global life. Also, it is a message to lightworkers involved in Earth healing and means, "Get to work because Mother Earth needs you right now." In 1991, when I was hosting the talk show "The Metaphysical Experience", a woman named Solara was my guest. Her topic was Activation of the 11:11 Doorway. It was all about ascension and the beginning of awareness of the 11:11 code. In 1995, a Crystalinks' reader named Joe emailed about his experiences with the numbers 11:11, hence the file you are reading was first created, and in so doing I took a long hard look at this phenomena experienced by those around me. Each time Joe was about to go through another major spiritual awakening, an epiphany of some kind, those numbers would appear in his physical experience to signal the upcoming change. The numbers say, "Pay attention!" 11 represents spiralling twin strands of human DNA moving into a higher frequency of consciousness. Reality as a geometric design is based on numbers (universal language) that repeat in cycles to create the linear time experiment. In Pythagorean Numerology, a cycle is based on 9. 9=End. 9/11=End of the DNA biogenetic program running at the moment. You will experience a sudden awakening, after which reality is never the same. You are going to create clarity, healing and balance for yourself. Do not expect others in your life to be on this journey with you. It is yours alone, as it is for most souls. You will have to seek new friends of like mind who are also being triggered by the digits. Once you open the Digital Door, there is no going back. Your soul will automatically and quickly move you from level to level of experience until you 'get it'. Your consciousness is expanding and therefore you will manifest faster and with greater comprehension, becoming more aware of the meaning of synchronicities, that will become more and more frequent. They are created by your soul to help you remember that you are a soul spark in a physical program that is about to end, to evolve back to higher consciousness. Once you see your numeric codes you have activated something in your DNA codes and they will continue to appear until you 'get the message' ... it is 'time' to move on. Upon seeing your digital encoded numbers you may feel a sense of urgency or related emotions. Chill out! For NOW there is TIME! I started experiencing this rather bizarre occurrence when I was forty years old. At first I thought they were coincidences. I would stand with my back to a digital clock and something would make me turn around and I would notice that the time would be 11:11. These incidents intensified. I would be checked into hotel rooms on floor 11 room 1111. I started noticing these digits on computers, microwave ovens, cars, documents, etc. I decided to write about it on my website. I was immediately inundated by hundreds of emails from all around the world. Individuals were telling me their own 11:11 stories, almost always saying “I thought it only happened to me”. It is difficult for me to decipher what this is all about but my intuition tells me it is positive. The endless recurrence of these hours 11:11, 11:01, 11:10, 10:01, 10:11, 10:10, 1:01, 1:11 represents a positive connection and a gateway to the mysteries of the universe and beyond. For many years the numbers 11:11 have been mysteriously appearing to people all over the world. 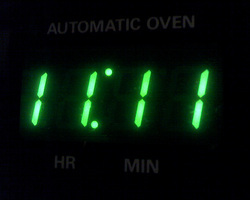 Often appearing on digital clocks, the sightings of 11:11 tend to occur during times of heightened awareness, having a most powerful effect on the people involved. This causes a reactivation of our cellular memory banks. There’s a stirring deep inside, a hint of remembrance of something long forgotten. The appearance of 11:11 is also a powerful confirmation that we are on the right track, aligned with our highest Truth. Throughout the years, I have personally encountered thousands of people all over the world who have experienced repeated sightings of 11:11. They all want to know what is happening to them and why. What does the 11:11 signify? 11:11 is a pre-encoded trigger placed into our cellular memory banks prior to our descent into matter which, when activated, signifies that our time of completion is near. This refers to the completion of duality. When the 11:11 appears to you, it is your wake-up call. A direct channel opens up between you and the Invisible. When this happens, it is time to reflect on whatever you are doing for a moment and Look Larger. A transfer is in position. You can enter the Greater Reality if you wish, pray or meditate and seed your future, and also you can be seeded by the Invisible. You can ask for help in some specific area of your life or simply listen quietly and receive a revelation. The appearance of 11:11 is always a beneficial act of Divine Intervention telling you that it is time to take a good look around you and see what is really happening. It’s time to pierce the veils of illusion that keep us bound to an unreal world. You have been chosen because you are ready to step into the Greater Reality. To lead the way for others into a new way of living, into a Greater Love. To ascend from duality into Oneness. As we unite together as One, bringing together our fragments of the key, we not only create the key, but we make visible the Doorway. Thus this bridge functions as an invisible door or a doorway into the Invisible realm. The 11:11 is the bridge to an entirely different spiral of evolution. Some of you have recognized this symbol as something of significance, yet have been unaware of its true meaning. With the advent of digital clocks many years ago, the significance of 11:11 began to make itself felt, often appearing on clocks at times of accelerated awareness. For those of you who have known that 11:11 was something special, we now need you to come forth into positions of leadership, for you are important parts of the key. 11 isn't just a precursor to change – it’s the whole point! 1+1 = 2 - unity, togetherness, peace.